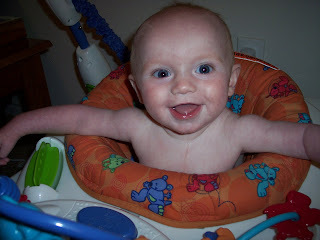 I can not believe that Andrew is 6 months old today. A half a year has passed in his life already. That seems so crazy to me. He didn't have the greatest 1/2 birthday. He didn't take a real nap until 3 pm. I think that he is cutting a tooth or something. He was certainly cranky. 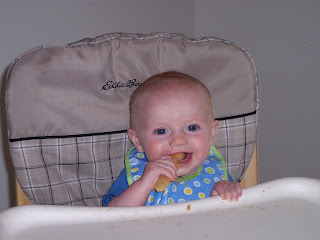 We gave him his first bitter biscuit today. He loved it. I think that was the first thing he put in his mouth that he didn't act like it was disgusting at first and I have given him some good tasting things. Mandy and Jenny were right about the messiness of them though. A wipe did not work, I had to put him straight into the bath he was so dirty. We think he is a pretty cute kid! 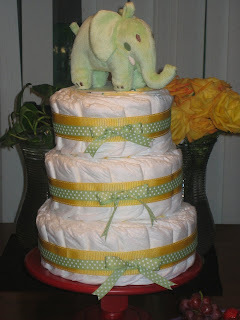 Here is the diaper cake that I made for Lacie Horner's shower. Thanks to Jenny's help it turned out really good. As a side note, Andrew finally officially initiated Dave as his father. He threw up/spit up in Dave's mouth this afternoon. I found it quite funny, Dave on the other hand can laugh about it but swears that it was the grossest thing he ever experienced. 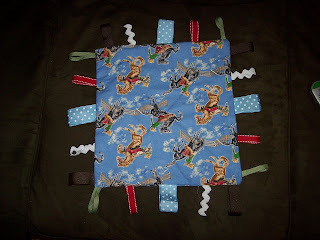 Here is my attempt at the ribbon blanket, thanks to Shelly's great instructions. When I first saw it on her blog I thought it was a great idea and I really wanted to try it out. I knew I needed to make it soon because I bought Andrew a set of cloth books this weekend and all he cares about with them is the tags sewn on them. It took a couple of hours to make (espescially with six kids running around the house) but it was so worth it when I had it all done and I handed it to Andrew. He grabbed it with a huge smile on his face, found a ribbon and shoved it in his mouth. I decided I better put a new post up so eveyone didn't have to look at my last title whenever you checked. Nothing new really. This is just a thought I have been having of late. I LOVE when I can have an intelligent conversation with another adult, espescially with Dave. I don't think I am to the point where I feel like I don't get any interaction with adults because Andrew can't converse with me yet. I am sure that time will come. Dave and I were driving home from West Jordan the other day and we turned down the radio and had a conversation comparing and contrasting the Communist governments of Russia and China. Both adding our insights I felt as if I was back in college again, it was great. But of course most conversations with Dave go like this..."I just had the greatest idea in how to improve an air conditioner, you know how an air conditioner works right?" Of course I learned how one works at one point of my life but it was not something I chose to retain. Dave then goes on to explain to me. Lets just say that I am an intelligent person but Dave's knowledge if much, much more vast! Sorry for the language but yesterday was pretty equal to that. The day started out fairly well, Andrew woke up at 7:30am instead of 6:00am. I was pretty excited, but it all went down hill from there. Instead of putting him down for his morning nap when he was showing signs of tiredness I kept him up because we had a handy man from our builder coming by to fix some things. I put Andrew down after he left and Andrew pretty much cried the rest of the day. The only time he slept was on the way to and from Costco. That is about a 15 minute drive at the most. Not to rehash the whole tragedy, I thought for sure he would be exhausted by his bedtime. NOOOO! He cried and cried, Dave tried everything and he finally fell asleep an hour after his bedtime. Can it get worse? Yes, he woke up at midnight. Luckily he was just fussy not actually crying so I let him work it out himself, but of course I couldn't sleep while he was awake so I didn't have the best night sleep either. I guess the question I pose is WHY? The only thing I have come up with is that there must be bad days to appreciate the good. Today, things are pretty much back to normal. He woke up around 7 and has taken all his naps. Crazy kid! On a lighter note, Dave is a big listener to sports radio and they are running a contest were a person can win his and hers motorcycles. Heath wanted Dave to sign up wtih him when we were in West Jordan on Tuesday so we stopped by a store and signed up. They drew a name an hour later and the person's name they called had 12 minutes and 80 seconds to call in. Yes, I am sure you have guessed it, they pulled my name. I called in and now on August 18 me and about 30 other people get to go to the Harley Davidson and see if a key they give us starts the motorcycle. No, neither Dave and I would ever drive a motorcycle but I would love to win. Dave's car is falling apart piece by piece, we could use some new transportation! Here is our latest family picture. It was actually taken by our 3 year old niece Lily. Not too bad for a 3 year old. This was taken at Cherry Hill at Dave's family reunion. It had its ups and downs. UP-It was so much fun riding the water slides. DOWN-Andrew was not a fan of the water. 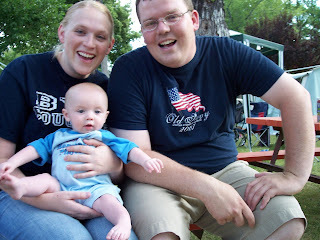 UP-Andrew loves playing with is Aunt Rachel and Uncle Timmy while Mom and Dad rode the rides. DOWN-There was a massive wind storm in the middle of the night, lets just say I could not sleeep! UP-Andrew slept through the whole thing, I even made Dave check his breathing in the middle of the night because I thought for sure he was dead. I am excited that we will be able to take Andrew camping again, hopefully that there are no windstrorms. Babies do sleep in cribs! 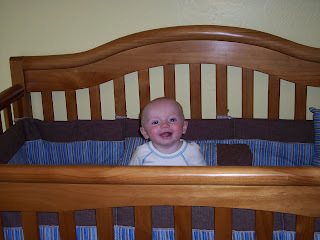 I thought that I would announce that Andrew can now sleep in his crib through the night. The transition actually went pretty easily. I only had about a week were he woke up in the night. Thanks to Emily's reassurance I was able to get through it. You were right Emily, he just decided one day that he no longer liked sleeping in his car seat. Unfortunatly, all this happened while my family was here so the transition was interrupted by a family reunion to Heber and now we are leaving for Cherry Hill for a family reunion with Dave's family. Hopefully all will resume to normal after the trips. Not much else has been going on. The other picture I posted is one a took a while back. 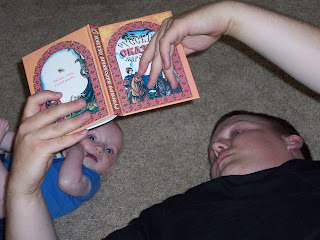 Andrew was being super cranky so Dave layed on the floor with him and started to read him a Russian children's book. He was quiet for about 20 minutes. It was too cute not to take a picture.